Washington, April 10 – The International Franchise Association (IFA) today encouraged its members to apply for the U.S. Department of Labor’s (DOL) 2019 HIRE Vets Medallion Award. 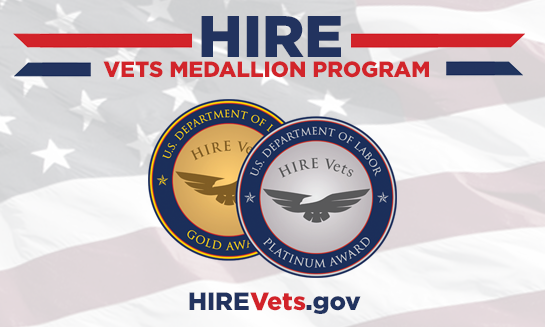 This DOL recognition is the only federal-level award that recognizes employers of all sizes for their leadership in recruiting, employing, and retaining America’s veterans. The Honoring Investments in Recruiting and Employing American Military Veterans Act of 2017 (HIRE Vets Act) was signed into law by President Donald J. Trump on May 5, 2017. This year marks the first full year of the award competition. Applicants are evaluated on a range of criteria, including veteran hiring and retention rates, the availability of veteran-specific resources like leadership programs and dedicated human resources, as well as compensation and tuition assistance programs. Individual franchisees, multi-unit franchisees, and corporate offices of each brand are all eligible to apply. To complete the application process, employers must verify that their company meets the award requirements, pay the application fee, and ensure compliance with the Uniformed Services Employment and Reemployment Rights Act (USERRA) and the Vietnam Era Veterans’ Readjustment Act (VEVRAA). The deadline to apply is April 30, 2019. To learn more about the award, and to apply, please visit HireVets.gov.